Where the initial solution was almost universally for knife cutting using tangential drag knives and oscillating knives, and for kiss cutting vinyl and photo paper primarily, the market has changed dramatically to include other rolled goods. In the fall of 2013, Steen Mikkelsen was honored by Sign & Digital Graphics Magazine as the "inventor of digital die-cutting/ finishing." 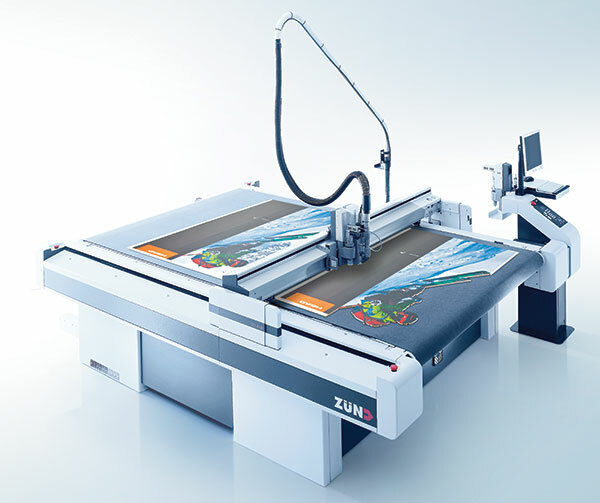 In 1999, Mikkelsen was instrumental in bringing together Zund cutters and i-cut™ (a vision system that ensured cut files matched the print, rather than the original art), thus bringing digital die cutting to the screen printing industry. 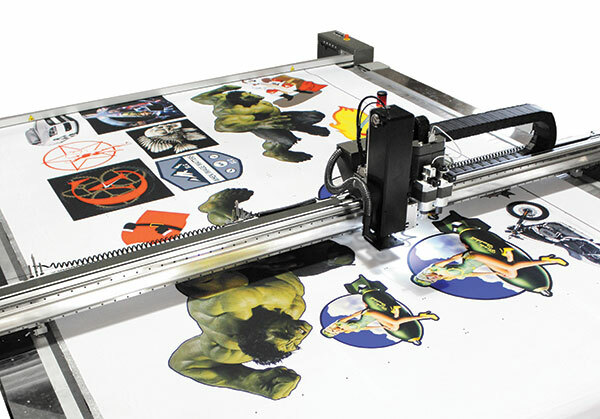 In 2001, as grand-format digital printing started to take off, screen print customers who had seen this new technology work for them in smaller formats started to clamor for wider and longer print applications using the same kind of technology. The average system was still relatively small in 2003 - typically five-by-five feet, and cost well under $100K per system. Over the last 10 years, the average size and price has doubled, typically including "cutting" areas of five-by-10 feet or larger and may cost upwards of $200K. Today, available solutions range up to five meters or 16 feet in width, and 20 feet or longer in length. I have personally seen a laser and driven wheel knife system for fabrics that had a six-by-40-meter cutting bed. It is really amazing to see a technology that started around modified pen plotters in smaller sizes now able to handle giant cutting areas at faster and faster speeds. Where the initial solution was almost universally for knife cutting using tangential drag knives and oscillating knives, and for kiss cutting vinyl and photo paper primarily, the market has changed dramatically to include other rolled goods - e.g., fabric and composite materials; cardboard and corrugated materials; and various kinds of rigid and semi-rigid substrates from Coroplast to Sintra, acrylic to wood to re-board and even aluminum that can now be professionally printed. As advancements in digital printing continue, the ability to print on varied materials becomes more accessible, in particular with regard to rigid substrates. SGIA's 2012 Wide Format Inkjet Equipment Benchmarking Report states that the rise of flatbed printing has contributed to rigid substrates entering the digital printing space. "…foamboards - several types, rigid plastics, and corrugated boards are the most widely used rigid materials in our industry," the report shares. Today, more and more finishing capabilities have been added to the mix in order to handle the growing diversity of printed product offerings, giving customers all of the knife choices, as well as milling/routing choices, and even laser cutting and etching capabilities. Where the early choices were full-laser systems, knife-cutting systems or routing-only systems - all with vision correction - today's market includes four realistic segments depending upon a shop's needs for size, volume and material type. 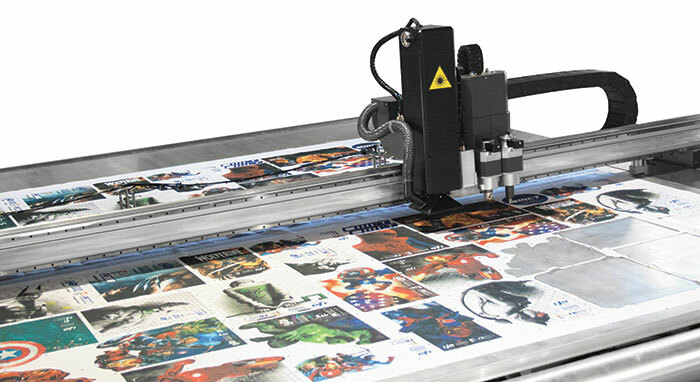 These "cut to print" capabilities are now available with one cutting technology, such as laser, in machines for small sizes: Typically two-by-three feet for smaller sign shops or screen printers at prices starting around $30,000 with vision systems, all the way up to 10-by-10-foot solutions with all of the cutting and routing technologies and automation capabilities at prices up to $300,000. Whatever the customer's need, there is a solution available. And as the grand-format print capabilities get bigger, and faster, and are able to utilize many new kinds of materials for print, the needs of the market change. This impacts the vision software as well. Whereas i-cut was the only adequate vision system in the early days, today, virtually every finishing table manufacturer has their own vision system, or licenses one, with significant different choices for the customer, differentiated primarily by the user interface and the machine capabilities, rather than by the accuracy of the "cut to print" capability. It is interesting to note that in the typical SGIA printer's market, all of these systems still rely upon some form of printed register marks applied through the RIP, or via Adobe Illustrator, in order to properly use the "cut to print" capabilities. As print jobs have gotten more sophisticated and the material range has increased, the number of necessary register marks has become a time constraint, and the ability to utilize products that do not have pre-printed marks has begun to impact expansion of the use of digital finishing. At least one company now has a patent pending on a new type of vision system that will allow the generation of accurate cut lines up to five times as fast as when using register marks, and will significantly improve the total time it takes to process smaller jobs with easier operation, and without the need to pre-print marks. 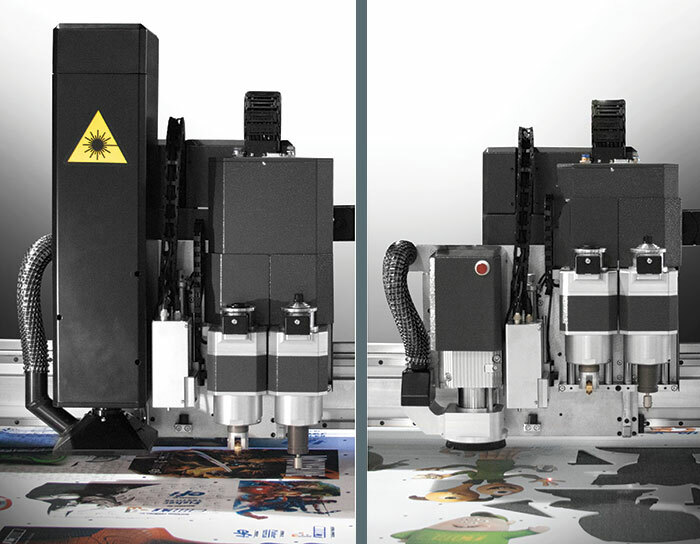 In 2009, when I moved from the grand format-cutter market into laser cutting and etching, the typical digital finishing installation consisted of one "cutter" supporting multiple printers; this was due to both cost and speed in comparison to the print process and the jobs requiring digital finishing. When I returned to print finishing in 2011, it appeared as if the missing market solution was a lower-priced product that would better meet the needs of lower-cost grand-format printers. There is a market for an under-$100K digital finisher, and sales are flourishing. These, however, are only good starter machines, and may not have enough capability to keep up with the growing demands of a company that needs to finish whatever the next customer requires. I remember an earlier time with composition systems for typography, where lower priced machines had fewer features. That market clearly told its vendors that smaller companies actually needed more capability, although it could be slower, to handle less volume, because they didn't have the back-up staff to handle things that larger companies were able to handle separately. For digital finishing, this has also begun to happen, as companies look for a reasonably priced system that will do more, rather than just a less expensive solution. On the other end of the spectrum, major changes in printing capacity and widths are beginning to change the finishing needs for that segment. To keep up and provide anything the customer needs, speed requires a move to systems that can handle 10-foot widths for rolled goods and rigid materials. One emerging need is for pendulum routing, where two five-by-10-foot printed rigid boards fit on the table at one time, and one can be offloaded while the other is routed, saving significant time compared to loading and offloading single boards. Savings of more than 25 percent are commonplace with such a capability. A second emerging need is for ~10-foot-wide fabric rolls that can be easily loaded and finished. Here, rather than traditional cutting tools, a combination of lasers finish the edges of polyester fabrics to keep them from fraying, and knife cutting of non-polyester fabrics has become important. For these systems, it is as important to handle the heavy fabric rolls and ensure quick cutting ability. Small-format machines, both laser or router with vision capability for those who need to cut/finish smaller graphics, but whose business is not primarily this. Typical products cost $30,000 to $50,000. Large-format routers with limited cutting capability, and/or cutters with limited routing capability that satisfy the needs of sign shops and new entrants into grand-format printing where there are limited material needs and/or limited throughput needs. Typical products cost $60,000 to $80,000. 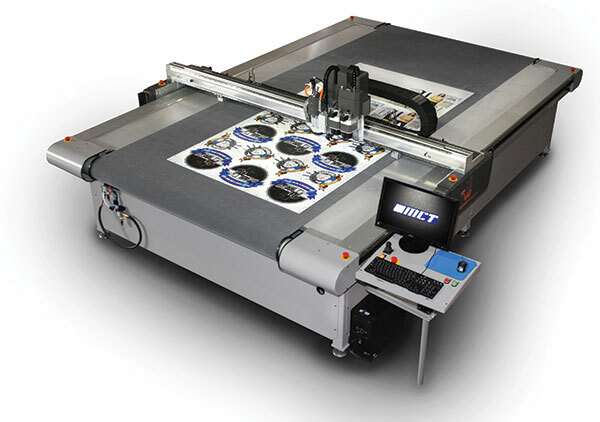 Large-format digital finishing where all modes of finishing are desired and throughput is important. Some solutions might excel at knife cutting, some at routing, and some at laser cutting, however, the market need is moving toward having all modes available at more attractive prices than in the past. Typical prices start around $125,000, and go up to $225,000 for a five-by-ten foot finishing area. Grand-format solutions with greater material handling capabilities are the newest market segment. Here, quality and throughput are equally important, and the ability to handle 10-foot-wide rolled fabric has become a major market driver. Coupling this need with the ability to handle rigid materials more efficiently has spurred solutions that incorporate ALL cutting modes a customer might require in a single solution. 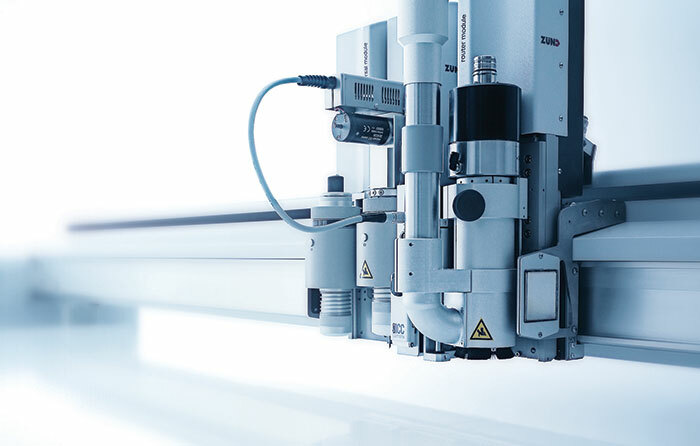 High-speed operation in grand-format, along with laser, knife and routing modes are all necessary. While many shops don't need all the technologies for the market niche, some shops need all, insisting that they be able to efficiently finish prints for everything a customer might bring for them to accomplish. Prices for such complete solutions start around $165,000 for 10 by 10 feet with knife cutting plus routing, and can approach $300,000 for all capabilities including automated fabric roll-off and/or automatic sheet feeding. Robotics for finished graphic offloading is also now becoming available, but not yet hitting its stride. A new and developing niche is the ability to handle the patterns for custom and short-run clothing fabrics. One pitfall here is the inability to properly cut to print patterns that have no register marks printed. The final niche is for grand-format, high-speed rectangular cutting without the need for special shapes, on rolled materials that have been printed with unique register marks to supply cut parameters. These systems can be steel and/or heat-knife based. The big growth market for rectangular cutting of printed fabric is increasing the need for hot knife capabilities for edge sealing. Depending upon width and whether hot knives are included, these systems sell for $40K to $85K. From a buyer's perspective, there are many choices today compared to those in 1999 when this new digital die cutting market just began. I must emphasize, however, that just because two systems generally look similar and have the same cutting-bed sizes and tools, their performance may be very different, and they may not handle all materials with the same speed or quality. It is always a good idea to have samples run of the various materials you wish to produce, so that you can see that the selected system will, indeed, work in your plant. Ease of use and software integration are other issues. There are many good solutions available, and not all of them are better purchased from a single vendor. Also, think about where you are properly automated and where you need help. For example, all finishing estimating time products are not the same. One may allow you to more accurately determine what to charge before you get the order, keeping your pricing and plant utilization in harmony, while another may give you no help at all in true estimating, but provide only a good idea of how long to schedule the job in finishing after you have the job in house. These are two very different concepts. Similar nuances may apply to other parts of the workflow from quote to delivery, and not every shop works the same way. Happy hunting, and let the buyer beware! Steve Aranoff, founder and principal of ARTTEX Associates has over 40 years' experience in the development and profitable distribution of products for digitally printed and converted images. Steve has provided pragmatic business, marketing and sales strategy and implementation consulting to both large and small client companies based upon his successful operating expertise - including managing distribution channels and successfully bringing off shore products to the domestic market. For the last 10 years, Steve has worked totally in the digital finishing marketplace. Steve holds a Masters Degrees in Systems Engineering and an MBA Degree, with Distinction, in Sales/Marketing. This article appeared in the SGIA Journal, May/June 2014 Issue and is reprinted with permission. Copyright 2014 Specialty Graphic Imaging Association (www.sgia.org). All Rights Reserved.